The 3 Best Dental Anesthetics - is YOUR dentist using them? One way or another, dental anesthetics are of interest to us all. When you're having some dental treatment, you want to be confident that the tooth is completely numb - and that includes me, both as a dentist AND as a patient! But which is the BEST anesthetic? We have carbocaine, marcaine, articaine, septocaine, as well as the older lidocaine and novacaine. Does it even matter? 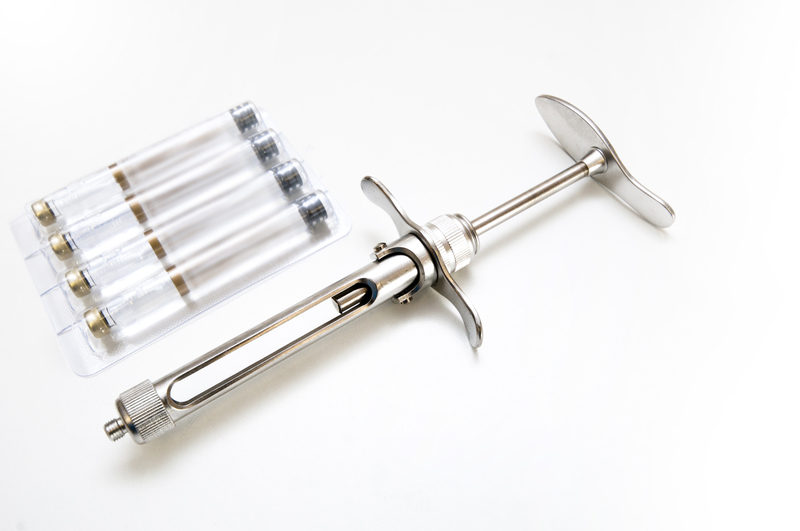 Dental anesthetics - a painless shot! You'd also like to get a PAINLESS shot, too. After all, what's the point in dental anesthetics if the shot is worse than the dental treatment? I've always thought it strange that a dental anesthetic injection can be painful. It just seems plain wrong! So here's a guide to getting a painless shot. Please feel free to print this out and show it to your dentist if you feel it might be useful! Here are the main points, and I also include some tips of my own. First off, YOU THE PATIENT need to follow the dentist's instructions as well as you can. If he asks you to stretch your mouth open really wide, just do it. And hold that position. It will make the shot more comfortable. And if he asks you to close your mouth up and relax your cheek, just do it. And keep your cheek relaxed! Again, it's to make things more comfortable. Those are the two main things that a patient can do to help the dentist. Dental Anesthetics - how to get a painless shot! Now your dentist has to do his bit! First, a surface anesthetic gel. This numbs the gum before you get the shot, but the dentist has to get a few things right. He needs to use a good quality product. The best I've found is from a compounding pharmacy in Nashville, and the gel is called Tricaine Blue TAG. Next, the dentist needs to dry the gum with a cotton wool roll before he puts the gel on. Then he needs to let the gel sit in place for at least 3 minutes. Even better is 5 minutes. Some dentists get a little impatient or restless while the surface anesthetic gel is sitting there, but it's definitely worth waiting that little extra time! Next, he needs to use a local anesthetic called Citanest Plain - it doesn't have any adrenalin in it, and it is neutral on the acidity scale, with a pH of close to 7. Nearly all other dental anesthetics are acidic - it's like injecting lemon juice! OUCH!. Your dentist should just put a couple of drops of the Citanest Plain in there first, then wait another 3 minutes. Then he should VERY SLOWLY add the rest of the Citanest Plain. If this is done very slowly, over about 4 minutes, you shouldn't feel a thing. Now you need to wait 2 minutes while the gum goes numb. The Citanest works very quickly, producing a rapid and profound numbness in the area, but it doesn't last long, so the dentist has to add a second shot, but this time with a different, longer lasting anesthetic. I believe that the best for root canal is Articaine 4%. Again, the dentist should give the shot very slowly, taking about 4 minutes over it. It's like getting a shot in slow-motion, but you DO NOT feel anything. Over the next 5 minutes the tooth will get extremely numb. When I use this technique, which I learned from Dr. Kit Weathers, I can't remember the last time a patient felt any discomfort. If you've been adding up all the minutes in that list, you'll see that it can take about 15 minutes all up just to get the tooth numb! That's a lot of time in a busy dental office. What are the advantages to doing it that way? If it's done correctly, you do not feel any discomfort at all. Nothing. It's a painless shot. Your tooth will be profoundly numb, first time. It's very unlikely you'll need another shot. You feel more confident, because you've felt nothing getting the shot and your tooth is OUT TO LUNCH during treatment! The dentist can now get your treatment done more quickly, because you are relaxed, and he's confident you won't feel anything. He won't have to spend another 5 minutes giving you yet another shot. For all the above reasons, the actual dental treatment is much less stressful for everyone in the room! I believe it makes sense to invest that extra 15 minutes right at the start of the appointment. 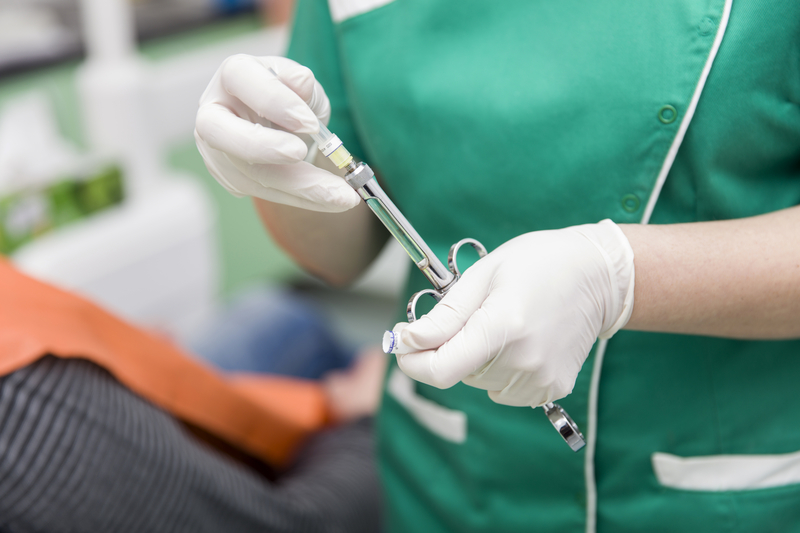 So which dental anesthetic should the dentist use? As I mentioned above, the first one should be Citanest 4% Plain. It's non-acidic, so it doesn't cause any initial discomfort; and it works REALLY quickly. Unfortunately, it's been difficult to get hold of over the past few years, especially in Europe. An alternative is basically any other dental anesthetic that does NOT contain adrenaline (Epinephrin). This is called a "plain" anesthetic solution. 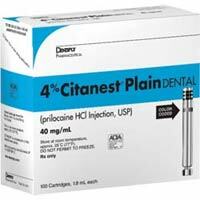 Citanest is the best, but other "plain" anesthetics are almost as good. They will all cause a rapid onset of numbness. But it doesn't last very long. The second anesthetic is usually Lidocaine or Articaine. Articaine is the same as Septocaine. It is very widely used in Europe, but not as much in North America. 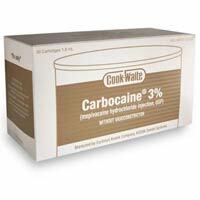 Carbocaine is the trade name for mepivacaine. It's not used a lot, but it's a good anesthetic. It works rapidly, and lasts for a reasonable length of time. These 2nd anesthetics DO contain a small amount of Adrenalin (Epinephrine), which closes down the blood circulation in the area slightly, so that the anesthetic effect lasts longer, normally 45 minutes to 90 minutes. Marcaine is the trade name for bupivacaine. This is an exceptional anesthetic, in several ways. It has a very rapid onset, and produces a profound anesthesia. Here's the special thing - it lasts for seven hours or more! This is a VERY STRONG dental anesthetic. Another special property is that, as it wears off, you get all the normal feeling back, but it continues to block pain for several hours more. It's probably best used for long, invasive procedures such as dental implants. What are the possible reasons for anesthetic failure? Inflammation. Any inflammation around a tooth, or in the area where the shot goes will always reduce the anesthetic effect. The technique I wrote above usually gets round this. The commonest cause of inflammation is infection. Poor technique. There are several aspects to this, including accurate positioning of the shot, very slow administration, the amount of dental anesthetic given, and the type of anesthetic. Bad solutions. By this I mean dental anesthetic solutions that don't work properly because they are out of date, or have been stored somewhere too warm. Some dentists like to warm up the anesthetic cartridge before giving the shot. They believe it makes the shot less painful. But if the cartridges are left in the warmer for too long, the anesthetic agent decomposes. Again, using the above technique means that the cartridge can be used at room temperature. There are other anesthetic techniques that a dentist can use in difficult situations, but they are more technical and really belong in a dentist's forum! But one technique that is gradually gaining acceptance is "anesthetic buffering". This involves adjusting the pH (the acidity) of the anesthetic solution immediately before injecting. This makes the solution active instantly - it is numbing the gum and tooth IMMEDIATELY as it is being injected! This means that the gum is going numb almost instantly as the dentist is giving the shot. As soon as he puts down the syringe, he can start work. SO - the shot is virtually painless, AND you are numb within seconds! Sounds great - but what are the disadvantages, and why doesn't every dentist use this? Unfortunately, it's not 100% successful - patients with red hair seem to be a little resistant to the technique. Also, it's expensive for the dentist, and therefore he must pass on the additional cost to you, the patient. The system and technology is also relatively new, and is still being assessed in general practice situations. And finally, to answer one of the most common questions about dental anesthetics - "YES", you CAN drive a car after getting a local dental anesthetic. The effects are limited to the gum and area of your mouth that was worked on. Any lighted-headedness you may feel is more likely to be from stress, worrying about the dental procedure, and the resulting uphoria when you finally get out of the dental office! Of course, a General Anesthetic - where you are "asleep", or sedation, such as with Hypnovel, are very different. You should not drive a car nor operate dangerous machinery for 24 hours following these procedures. I believe that great dental anesthetics should be at the heart of dentistry. With modern anesthetics like articaine, marcaine and carbocaine, I think it's criminal that a patient should feel any pain at all during dental treatment.